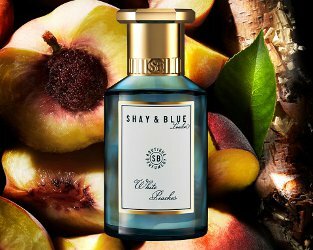 UK-based niche line Shay & Blue has launched White Peaches, a new fragrance. White Peaches was developed by perfumer Julie Massé. The notes include peach, elderflower granita and silver birch wood. Shay & Blue White Peaches is available now at QVC UK, £49 for 100 ml. Well, dang. So far I have successfully avoided trying Shay & Blue scents, because the world is large and I don’t really neeeeeeed another house to explore, but. . .